“Guitar Player” mag took a recent poll asking: If you could only have a single pedal in your rig, what would it be? Overwhelmingly, and actually not too surprising to me, most pollsters chose an overdrive pedal. I personally didn’t take the poll, but I would definitely fall into the majority. You know me, I just can’t enough of overdrive pedals! 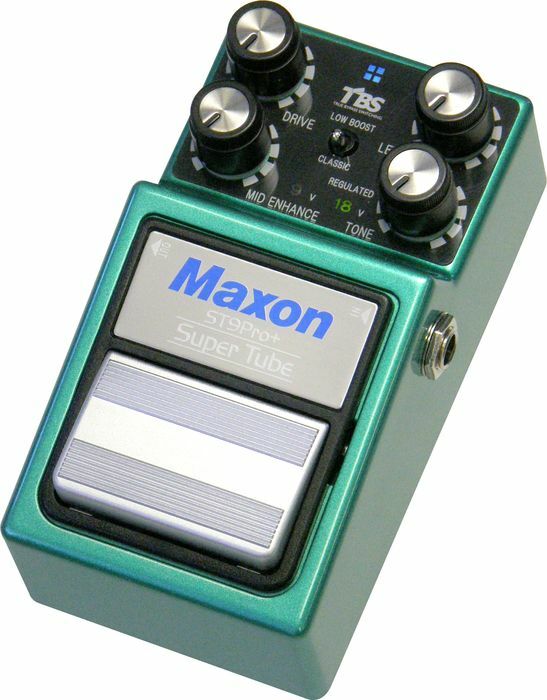 So much to my great pleasure, Maxon has released the new ST-9 Pro+ Super Tube Screamer Overdrive. Based upon Maxon’s classic “808” circuit, and building upon the original Ibanez ST-9 and its ability to control the amount of “midrange hump,” this “reissue” adds features that have the potential of making this a truly great Tube Screamer-class pedal. First of all, the ST-9 Pro+ sports 9V or 18V operation. 18V mode adds more headroom and warmth. This is controlled by a slider switch in the battery compartment. Note that you’ll need an 18V DC power supply to use this mode (the Dunlop DC Brick and other power supplies have 18V connections). In addition to the Drive, Level, and Tone Knobs, the ST-9 Pro+ also has a “Mid-Enhance” knob which controls where the mids are boosted. Clockwise moves the boost towards the high mids, while counter-clockwise moves the boost to the lower mids. To me, this is probably the most useful feature, as you can dial in the mid boost to adapt the pedal to different amps. The ST-9 Pro+ also has a switch that selects either “Classic” or “Low Boost.” Low Boost gives a 12dB boost at 100Hz and a 4dB boost a 500Hz. This can be quite useful for fattening up single coil guitars! Finally, the ST-9 Pro+ has true-bypass switching. OMG!!! I love the features on this pedal! Were I to consider getting another pedal in the Tube Screamer lineage, this pedal would be at the top of my list! However, with a street price of around $206, it’s not a cheap proposition. But with it’s features, it certainly warrants a close look; and based upon my experience with Maxon pedals, their build and sound quality is undeniable. While I don’t use it much any longer, my CP-9 Pro+ compressor is a testament to that quality (I paid $250 used for that pedal), and it’s a pedal I’ll always have. As for the ST-9 Pro+, I’ll see if I can find a place where I can audition it. For more information, check out the Maxon ST-9 Pro+ page!